For me, bedrooms are all about sleeping in or curling up with a good book. 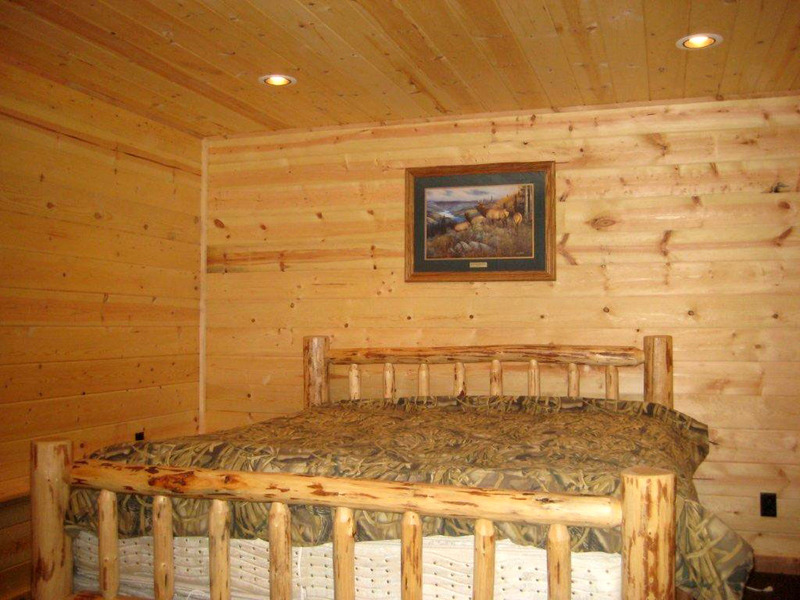 Relaxation is always paramount, so that was my primary consideration for the master bedroom at the Farmhaus. I’m pretty happy to say that we feel super relaxed in this bedroom, but it took time and a good amount of sweat to get it there. As a reminder this is where we started. Super dark and dingy. The first order of business was to brighten it up with natural light. So what did we do? We closed a window. Say what? Yep, we closed a window that provided virtually no light and opted instead to put in a patio door that gives the bedroom direct access to the deck. Go here to see the dirty progress. The patio door not only gives us a view, but because it is south facing gives the room the most light throughout the day. Closing up a window can be controversial see here, but sometimes it’s the right move. I stayed quite true to my original mood board, but when a friend decided that the runner she had bought didn’t really work in her house I put it to good use and added a touch of blue to the room. Here are more views of the room. Recognize those black and brass sconces from the round up I did a few months ago? I love them! Also, we like to think that the framed black and white photograph is an hommage to the the window that once was. I found the bedside tables at auction. Because the room isn’t large I knew I couldn’t fit a dresser, so decided to optimize my space with bedside tables with drawers. They’re clean, midcentury but show their age. I wasn’t sure if I was going to refinish them to their pristine state, but the more I lived with them, the more I grew to love their imperfection. Instead of putting the bench right at the foot of the bench, I opted instead to put it against the wall to allow for better traffic flow. The hooks above it allow me to use the vertical space, plus clothes don’t end up in a pile, they end up hanging, which seems ever so slightly more tidy. All in all, it’s a mix of vintage finds and savvy shopping. You can find similar items here: grey upholstered bed, brass and black sconces, brass flushmount, white cotton pintuck linens, nightstand with drawers, black rattan basket, midcentury bench, shaker wall hooks, blue cotton blanket. Hope you like. We LOVE it! When it comes to Halloween, I’m really not into the black, orange and purple decor that tends to dominate. Even if it’s a party for kids I like to keep things clean and modern. I also love to personalize gatherings with DIY touches that make things feel special, but I don’t love DIY projects that are overly complicated and super time consuming. With that in mind, I pulled together some easy, chic DIY ideas for a modern Halloween celebration perfect for an adult get together. We love our kids, but not every party has to be about them. Am I right? The easiest project here is the mask, which is simply a printable. Pair it with with an all black outfit and you’re done. I am also totally in love with the mud cloth inspired pumpkins. How cool are they? What about the spiders on the drinks and the bats in the window? A little can go a long way to setting the mood. Wishing you and yours a fun and safe Halloween. My recent Farmhaus Dining Room Reveal made great use of wood paneling. I choose to add the shiplap paneling in the entire Farmhaus because the walls and ceilings are textured. I wanted to draw the eye away from the texture through the use of lines. If you didn’t know this before, your eye will naturally gravitate to lines, especially when they are repeated. This got me thinking about wood paneling and how it can be used to great effect to add interest to any room. To some wood paneling may sound retro or rustic, but it is far more versatile than you might think. Check out how it can be used whether your style is New Traditional, Modern, Scandinavian, Rustic Modern, or Original. Whether stained or painted these examples of new traditional wood panels feel fresh. Repetition, geometry and modern paint selection help bring these rooms out of the 19th century and into today. Many of the examples above use low profile molding to create details on the wall that blend seamlessly with a home’s more traditional architecture. 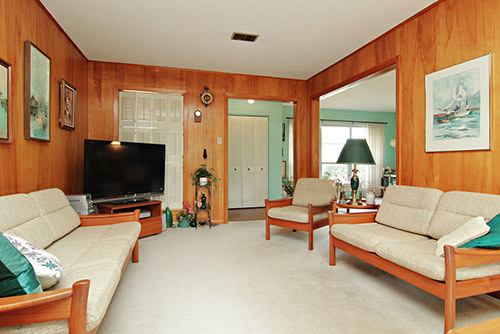 If your decor style is modern, wood paneling can add interesting textures and patterns. That’s where I was going with my choice of a clean shiplap look. But don’t you love the look of the gray stained plywood? It’s moody and modern. I hope I can use this look in a future project. So, I’m not one of those chevron loving people, but I do love a chevron or herringbone pattern with wood. Maybe it’s because the oak floors I grew up with in Paris were chevron. Either way, I think it works well with wood, either on the floor or on the wall because the effect of the pattern is subtle. If you want to go for a clean, simple, yet warm aesthetic, nothing beats the Scandinavian look. In this case, I think what really captures the spirit of this style is the spare design and the use of simple, functional materials. In fact, you can take a utilitarian sheet of plywood and transform your home into your own version of a Stockholm apartment. Recently, however, reclaimed wood has really been on trend (read hipster bars and restaurants all feature this material) What’s nice about reclaimed wood is that it’s a recycled material and the patina of the wood gives it its charm. If this is the look for you, you can easily replicated it using a product like Stikwood which comes in many finishes and literally sticks on the your wall. No tools needed. But if you want to go for a modern rustic look, reclaimed wood isn’t the only way to go. Board and batten can be super rustic modern, as can shiplap or vertical planks. But why stop there? You can create your own original pattern, add greater depth, mix materials, etc. Heck, the only limit is your imagination. Just make sure it works in your particular space. One of the best most, original wood panel wall treatments I’ve seen is from Vintage Revivals. A multicolored hex wall may not be for everyone, but in her space it is absolutely brilliant. Update: 9/21/16 If you are visiting from Apartment Therapy, welcome to my blog! I’m so honored that our dining room was featured. Be sure to sign up for updates and like us on Facebook as I will be posting many more Before & Afters of the Farmhaus in the weeks to come. You can also check out past renos here. When I envisioned it, I was going for a rustic modern scandinavian look. For me that means a light, neutral color palette, clean lines and natural wood tones. From the progress posts, you know that we chose a white oak look laminate floor. While we would have loved to put in real wood floors, we couldn’t justify the cost within the limited budget. Selecting the furnishings for the space actually all started with the huge abstract painting you see on the wall. One of my very best Vintage Finds. I found the painting at a local thrift store for a mere $59. It’s gorgeous, huge and signed by the artist. It has presence, and yet is very soothing. For months I’ve been moving it around the Farmhaus waiting for it to assume its rightful position on the wall. Hopefully its presence is sufficient to draw attention away from the in-wall heater. Again, we would have loved to install central heating, but couldn’t justify spending the money, especially as this in-wall unit a) works, and b)kicks off a very decent amount of heat. I spray painted the heater white and called it a day. Months later, at the same thrift store I scored the dining table for $60. I was immediately drawn to it because of it simple lines and chunky legs. It had a small ding, but as I looked under the table I discovered it’s actually from West Elm. What? The brand new version costs $900. So, I knew I had to snap it up even ifI knew it was a little on the small side for the scale of the room. Here you can see it in the room during construction. Hubby and I discussed various ideas for extending the table, but none of them were quite right. Until one day, I suggested we simply nail on some left over wood planks we had salvaged from the closets we had demoed. Such a simple elegant solution. Plus the wood was free. Can’t beat that! He carefully selected the planks and ran them through a planer to even them out. And pouf, within an hour we had a beautiful, bigger table and it had an even more rustic vibe. So perfect! I had always intended to use a modern windsor style chairs. I have a tendency to accumulate random vintage chairs, but this time I felt that that these grey chairs from Target would be perfect. They are comfortable, provide good support and a very well priced. The real pièce de résistance in the room is the gorgeous brass chandelier from West Elm. Nope, didn’t score this one second hand. I coveted it for a while on my pinterest board and decided it would bring the room together. Here’s another view. So, happy with the way it turned out. The bonus? The plums that are on the table are from our own plum tree! Kathie - Love what you did with this room…it is beautiful. I can’t wait to see other rooms! Maddie - Hello! Stumbled here from apartment therapy. II love your transformation – this is exactly the look we are going for with the condo we just bought. Do you have a source for the laminate flooring? I’m also curious if you have any thoughts on it so far, as it looks very similar to ones we’ve considered. Thank you!! Hope you are loving your new space. kim domingue - Wow! Popped over from Apartment Therapy…….love this room! The hubs and I are DIYers and doing it all yourselves is way more work than most folks realize! Y’all did a lovely job! The flooring is Armstrong Premier Classics Lakeside Oak. If you search online you can find vendors. However, shipping does add up. I got an online quote, then got a local company to price match the sq ft price, plus no shipping. So far, so good. A lot of people who’ve come through are surprised to find out it’s laminate. Ask me again in a few years to see how it wears. 😉 Good luck with your reno. isadorag - Thanks for leaving a comment Kim. Always good to hear 🙂 Since you do DIY, you should check out the construction posts I did. You can read all the nitty gritty of the not so pretty stuff and appreciate the effort that was put in. Be sure to stay in touch. I’ll be posting more reveals soon. Jo - I LOVE this room! We are moving into a house with a very similar room that we want to brighten up. Please let me know where you got the plank wall siding! Thank you! isadorag - Hi Jo, glad you like it. We went to our local Lowe’s and bought sheets of paint grade 1/4″ plywood and had them cut it down into 8″ strips. Then we secured it to the wall with a finish nailer. Then we primed and painted. You can see us putting it up in the living room in this post: http://www.relocatedliving.com/construction-the-farmhaus-project-part-4/ Good luck with your project. Last week, I finally wrote about Monkey’s 5th birthday. I didn’t go too crazy on the DIY elements of his Star Wars party. Work and the Farmhaus have been eating up all my time, so I tried to keep things on the down low. One thing I really did DIY was the gift bag. I couldn’t find a Star Wars gift bag so I decided to make my own. I love keeping designs simple and graphic and I have a love for all things Black and White (see here and here for evidence of my DIY design inclination). The design I ultimately came up with was clean and simple. It features the silhouette of a stormtrooper and some text that reads, “Thanks for coming. You’re a real trooper.” Cue cheezy music, I know. But hey, it’s a kids party. The bag was super easy to make once I came up with the design. I just printed 2 per sheet of paper and stuck them on store bought white paper bags. At Michael’s I found some black sparkly tissue paper and I know I had to include it. The paper looks like a starry sky, perfect for a DIY Star Wars party. Inside the bag I had a small selection of Star Wars themed goodies I bought at Target, including baggies of Star Wars gummies. If you’d like to make your own DIY Star Wars gift bag. Download the free printable here. Enjoy!